M-MEX successfully organized its second design workshop in Doha, Qatar from Feb 24 to 28. 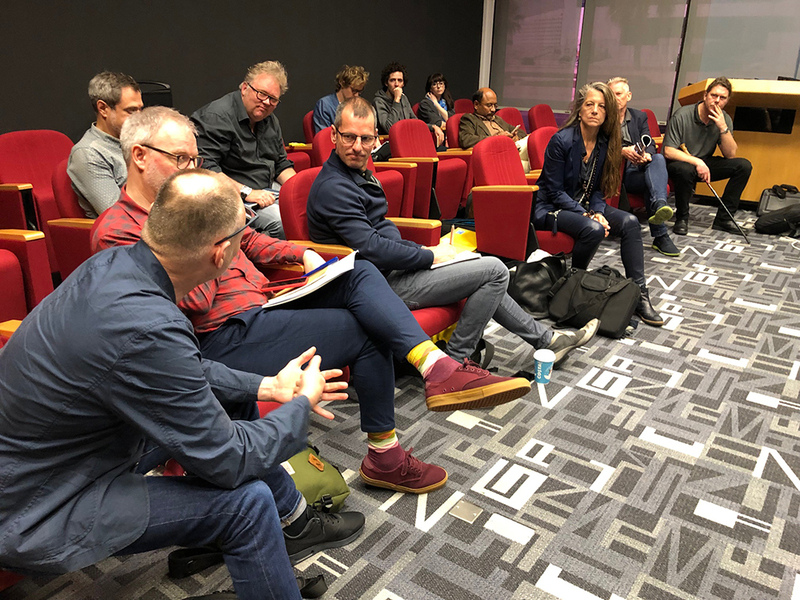 Delegates from all five national teams and one collaborator joined the event and worked on ways to consider and implement the M-NEX platform in a fast-growing arid city. The M-NEX Research Project is funded by the Belmont Forum and the national funding agencies, amongst which the Qatar National Research Fund. 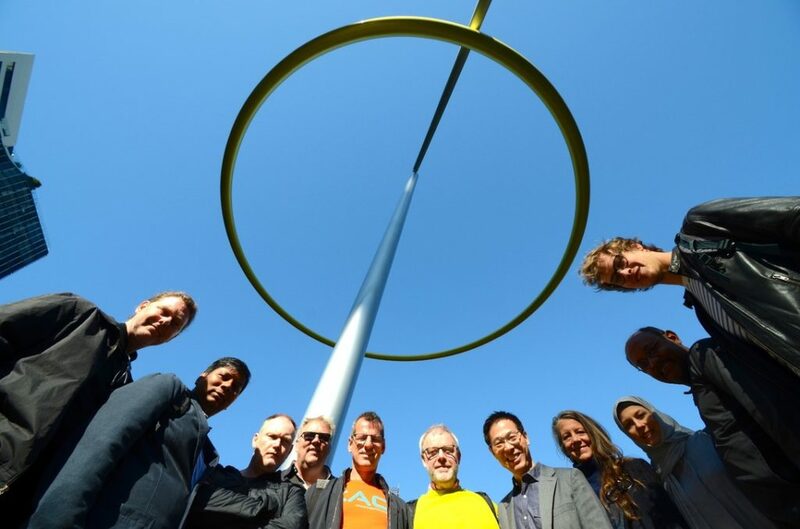 M-NEX – the Moveable NEXUS – looks at Design-led urban food, water and energy management innovation in new boundary conditions of climate change. It is an international research consortium, led by Professor Wanglin Yan at KEIO University Japan. The Qatar team is led by Professor Kas Oosterhuis. One of the key purposes of M-NEX is to understand the different needs and contexts related to the challenge of bringing Food, Energy and Water production into a single place. In the case of Qatar, energy costs are considered less important because it is an energy rich nation. On the other hand, food is actively blockaded by its neighbours, and water is almost entirely produced through desalinization of ocean water. The result is a kind of natural experiment that is especially rare, and in this way an important addition to the global picture that the team is collectively building. Learning from this unique setting was a key ambition of this second gathering for the international team. 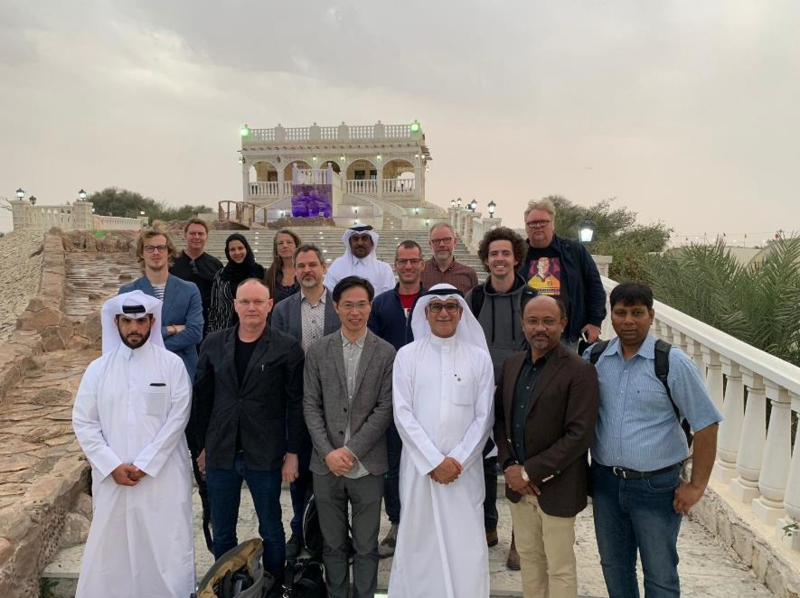 With this in mind the M-NEX group took part in a 2 day conference organized by the Qatar team, and visited two farms close to the capitol city of Doha (Torba Farms and Global Farms). The farm visits were pointedly organized in order to understand the way water and energy are being used in local food production. In the case of Qatar, national food production is a recent priority as result of a blockade begun in 2017. Saudi Arabia, The United Arab Emirates, and Bahrain closed their borders with Qatar, cutting diplomatic and trade connections after accusing Qatar of supporting Iran and of funding Islamist terrorist groups. Qatar denies these accusations; however it was left isolated as a result. Transport of food and other essential goods was blocked. As an import dependant nation this change in circumstances had a large impact, forcing changes in behaviour on many fronts. Qatar has an active seaport, recently expanding its capacity to manage goods arriving by sea, however the nation has at the same time decided to become more self-sufficient, especially in food production. The two farms visited represent two approaches to water use; one making use of a Dutch hydroponic system and the other using perma-culture techniques. Water was taken from an aquifer in the case of the perma-culture model, in which case there is a need for careful use of the water supply. In the case of the hydroponic system the water comes from de-salinized sea water, which has a significant energy cost. However, in a nation that is a global energy exporter, the energy cost related to potable water production was not seen as a large barrier, and rather the need for local food production was given much higher importance. The trigger for this desire was the blockade of Qatar, which began in 2017. Having experienced a massive impetus for change in order to cope with the blockade the local production of food took on new meaning. This is a significant point in light of the kinds of change that can be expected in other countries, many of them similarly created by outside forces. Being an energy exporter with a command economy, it is difficult to make a direct comparison of Doha with the other case study cities in the M-NEX research project. However, the fact that even a wealthy nation like Qatar can be pushed to adapt in such a massive and unexpected way highlights the shared need to be adaptable, and to include FEW calculations in urban environments across the globe. Building on this observation, in future meetings it would be useful to clearly describe the specific needs pushing change in each study area. This may help to understand better which aspects of the FEW-Nexus could be gainfully applied, and how responses could be tailored to different situations. The public conference held on the 25th February 2019 at Qatar University Administration Building included the international researchers, local speakers and stakeholders from Ministries, Academia, NGOs and industry. The conference was aptly named “Qatar and The Moveable Nexus: Design-led urban food, water and energy management innovation in new boundary conditions of change”. As part of the conference M-NEX research teams presented the progress of the project in each host city and University. In the process of presenting recent work on the Living Labs in each area it became clear that the ways in which Living Labs can or will be used is not only unique in each instance, but that the mix of top-down and bottom-up participants is important to compare across nations. If we affirm that implementation of FEW-Nexus concepts depends on a combination of both governmental and community-based initiatives, then it is essential to understand which groups are present and involved, and which groups are most effective in each case study area. In order to develop reasonable generalization at the international scale this is an important step. Presenters showcased work in progress, covering a very broad range of topics, from food production to tree planting, super-foods to the social aspects of food and heritage. Taken as a whole, the presentations described the ways that Qatar is already carrying out an ambitious approach to food production, as well as the degree to which various groups are supported with both traditional end experimental projects in the country. The conference highlighted the importance of engaging with stakeholders, and the differing positions that each hold in the FEW-equation. More interesting, the shifting position in society and the economy of each group was also clear. Participants had diverse backgrounds but shared an understanding that the context with regards to food, energy and water is currently malleable, and thus there is an opportunity to effect significant positive change for the country. 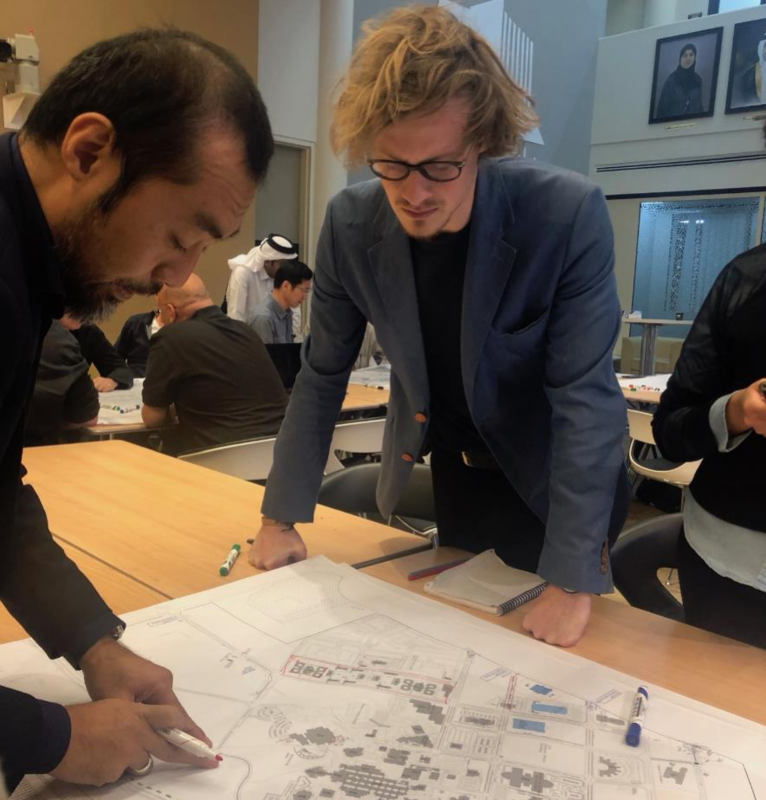 A Design Charrette Workshop for the Qatar University Living Lab was held the day following the conference on 26th February 2019 with the international researchers, local partners including AEB Arab Engineering Bureau and Turba Farms, Qatar University Capital projects and campus facilities, as well as Qatar University researchers and students in Architecture and Urban Planning. 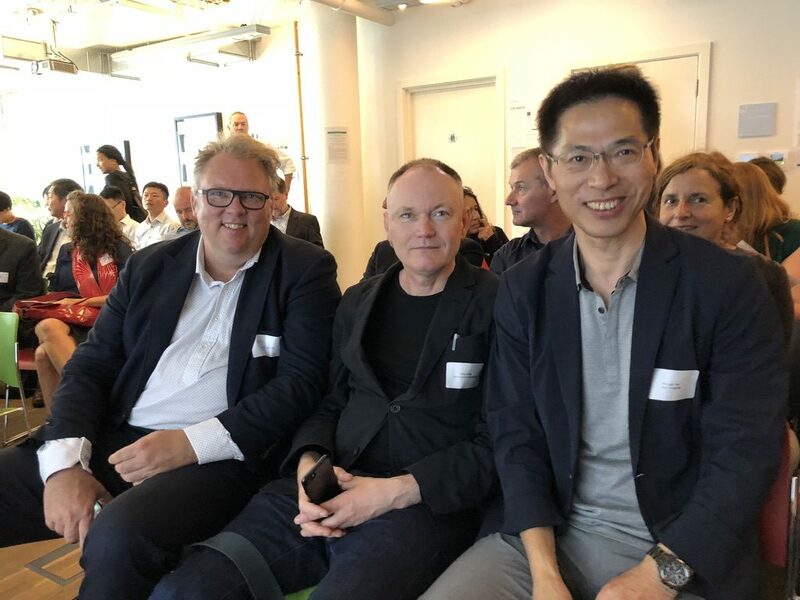 The charrette was designed to make use of the expertise of the visiting planners and architects who make up the international team, and to give them the opportunity to understand the issues directly as they worked with local stakeholders. 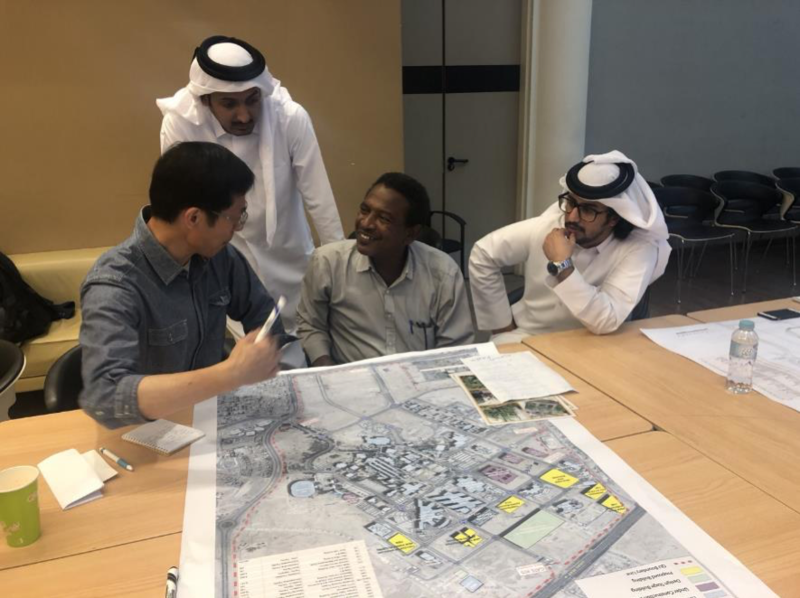 The topic of the charrette was how to integrate food production on the campus and more specifically to consider the themes of the Qatar Living lab which are the Urban Water Matching and stakeholder engagement, as well as the importance of improving Soil and Biodiversity for more resilient FEW systems. Technically speaking the campus already has a large irrigation system in place that could be expanded and re-tooled for food production. The Qatar Living Lab is proposing to additionally look at alternative water sources such as treated sewage effluent, water produced from air conditioning units, grey water, as well as saline water for use with halophyte plants. Developing efficient closed loop systems while increasing the cultivation of productive crops and plants in the landscape is an overarching ambition. Speaking with the students from the campus it was clear the university was organized around cars, much like the larger city of Doha. In a landscape defined by extreme summer heat it is difficult to retro-actively create a pedestrian environment to go hand in hand with food production, though students indicated they would appreciate such a change in their environment. Making use of the 7 months when temperatures are not too extreme for a positive outdoor life is a reasonable first step to transforming the campus. Future research in Doha will clarify the role of the various stakeholders, and the Living Lab in Qatar is aimed at including all of the relevant communities, including students, staff, migrant workers, and others. At the same time, the tours and conference indicate food production in Qatar is likely to be treated by the government as a technical rather than a social activity. In that case a top-down system, with fewer stake-holders may be inevitable. 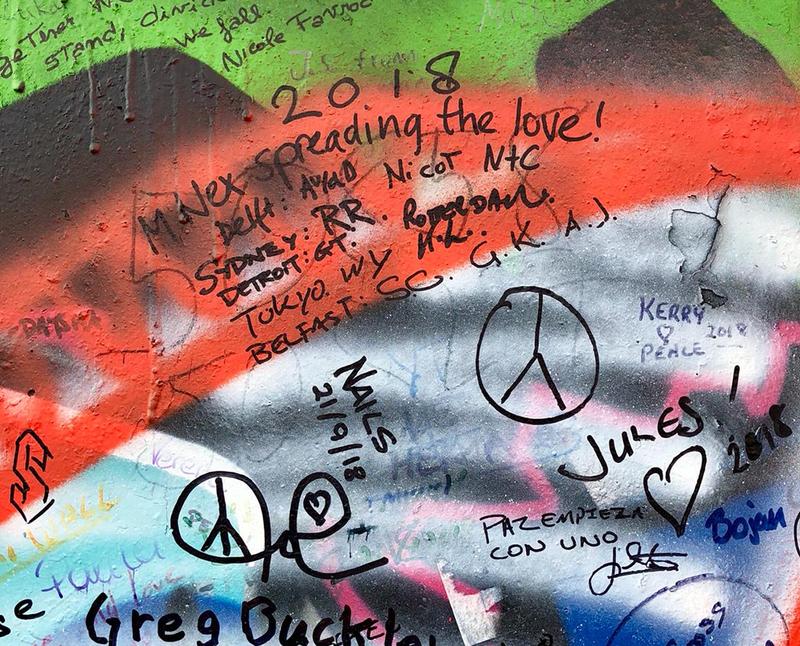 Future research carried out by the international team could usefully examine the role of stakeholders, and the relative positions of power they hold in each of the study cities, and consider how they impact the shape of the FEW Nexus in each instance. 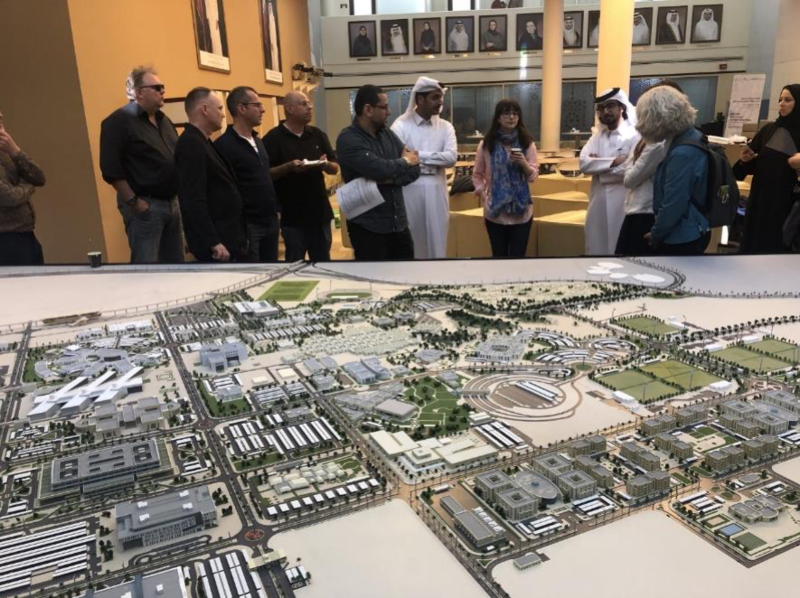 A final meeting was held at the Qatar Foundation to plan and discuss lessons learned for the next meeting in Detroit, Michigan, in the United States. A key point that was re-affirmed during the meeting was the need to use comparable methods and terms in each case study area. The purpose of this goal is twofold; to maintain a framework for the global project that will allow each case study to be meaningfully compared with the others; and to create a way to share information better across the study areas. At the final meeting the team also met with Dr. Abdulkarem Amhamed, Researcher at Qatar Environment & Energy Research Institute (QEERI) and Lead Principal Investigator of the Qatar Belmont project entitled SUNEX. The group discussed the possibility of taking advantage of shared goals and the differing methods used in each research team.